Money found in South Yorkshire interchanges will be donated to a charity supporting homeless people across the region. A total of £980 found or handed to interchange staff will be donated to StreetLink. The organisation aims to end rough sleeping by enabling members of the public to connect people sleeping rough with the local services that support them. 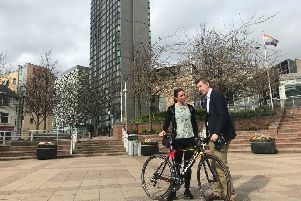 Dan Jarvis, Mayor of the Sheffield City Region, said: “It’s good to see this money going to a very deserving cause, especially at Christmas. “For many of us, Christmas is a time when all roads lead home. “But for too many people, this is the hardest time of the year. “A decade of austerity has resulted in more homelessness, poverty, debt and financial insecurity than we have seen in a generation. “I’m determined to do all I can to end homelessness in the Sheffield City Region. “That’s why, last month, I held the Sheffield City Region’s first Homelessness Summit, and I'll also be establishing a Sheffield City Region Homelessness Network. Any money found in South Yorkshire interchanges is kept for three months in case someone claims it back. After that period, the money goes to a fund to be donated to charities, chosen by South Yorkshire Passenger Transport Executive. “We’d like to ask anyone who experiences begging on any of our interchanges across South Yorkshire to contact StreetLink or a member of staff, so they can liaise with local charities who’ll be in the best position to help those in need. “Those charities ask for money donations to not be made directly to homeless people, as many times it can be used to fuel an addiction.